And yes, you read the headline right, this is indeed an HD-DVD review. Yeah, I know it's weird, but back in the day, I had an HD-DVD player, and even though the format is long since defunct, I thought it would be a fun historical curiosity to put the reviews on the site. 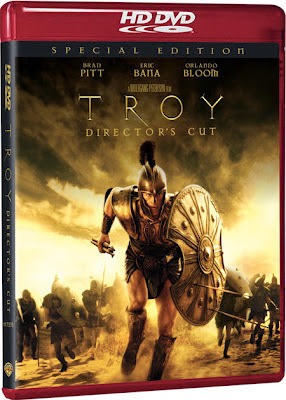 Continue reading after the jump to access my original review of “Troy: Director's Cut” on HD-DVD. In 2004, German Director Wolfgang Peterson released Troy, a film that went mostly unnoticed here in the States (except for some negative bashing from critics), but made 400 million dollars in the overseas market. Because of its huge worldwide success, Warner Bros. has let Director Wolfgang Peterson go back and re-cut the film to be more in line with his vision, and like many Director’s Cuts of historical epics, the result is a much richer, fuller experience. 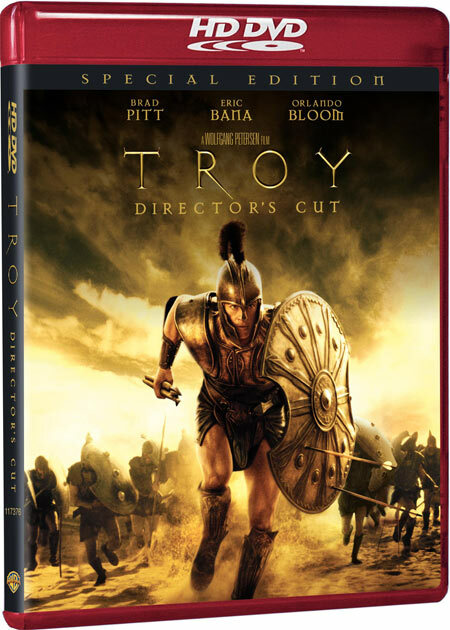 Troy tells the story of the Trojan War, focusing mainly on the Greek hero, Achilles (Brad Pitt), who comes to Troy so that his name will live on in glory for eternity, and on Hector (Eric Bana) and Paris (Orlando Bloom), two Trojan princes. Hector is to the Trojans what Achilles is to the Greeks, and Paris...Paris is a wuss who starts the whole war by stealing away Helen of Sparta from her unruly husband Menelaus, to come back to Troy with him. But Menelaus’s brother is King Agamemnon (Brian Cox), who has conquered all of Greece and has had his eye on Troy for years. By pretending he’s going to Troy to get Helen back, Agamemnon and the Greeks wage war on Troy, one that ends in tragedy. The film’s greatest strength is that is not trying to be a stringent adaptation of Homer’s The Iliad. It tries to present the Torjan War as if it really did happen, and they do this by not making the Gods characters. The characters speak of and worship the Gods, but no longer do the Gods influence the war. Because of this, it feels like you are watching a real war that could have actually happened. Things are changed around further than that, too, but it’s for the purpose of entertainment. What Homer originally sung and told is probably not exactly the same as in the versions of The Iliad we have today; Mythology is always changing. The battle scenes are riveting and excellent, and the Director’s Cut adds to this by making the violence more intense. I’m not a guy who likes movies because of their gore content, but the added blood and violence does help the film. In the theatrical cut, everything was very shaky because whenever someone was going to get speared, the camera just cut away to another shot. The added violence really just makes the film more intense and real. Brad Pitt, as Achilles, gives his finest performance to date. He definitely makes you believe that this guy was real, the best warrior who ever lived. He also makes the role more human, and grounds the whole movie in reality. His counterpart in Hector is also played very well by Eric Bana, who, although he doesn’t look or feel as strong, is very human, very smart, and the perfect match for cold Achilles. Orlando Bloom gives a mediocre performance as Paris. I don’t ever really understand why he loved Helen enough to start a war. Their love isn’t very well developed, but that’s more an inherent problem with the script than with the acting. He definitely plays Paris as a wuss, but that helps the film overall. Brian Cox as Agamemnon plays another wicked character, and as always, pulls it off in the most evil way possible. Peter O-Toole shines as King Priam, reminding us how good an actor he is, even in old age. The Director’s Cut is definitely an improvement over the theatrical version, though the difference isn’t as vast as the Kingdom of Heaven Director’s Cut, which turned a mediocre film to one of my favorite movies of all time. What the Director’s Cut of Troy does, mostly, is make the film seem more real. The characters discuss the gods more, showing their religion in a more realistic light. The violence is enhanced, making the battle scenes more vivid. There are added scenes throughout that help with the character development, and the entire picture has been brightened considerably from the theatrical cut, which had a very dark color scheme. On HD-DVD, this shows incredibly well. I’ve only seen 5 films on HD-DVD so far, but this is hands-down the best picture I’ve seen on all of them. Troy on HD-DVD is what Hi-Definition is all about. Every color is vibrant and jumps off the screen; you can count the blades of grass, you can see the individual grains off sand on the beach; you can see every ripple of water on the beach, and the people look as if they are standing right in front of you, in your living room. The whole experience is unbelievable, and validated the purchase of my HD-DVD drive for the Xbox 360. Hi-Def doesn’t make films better or worse, but it enhances the experience so much; it’s like being back in the theater, only you’re on your own couch. The audio is also very good. You can vividly hear every clang, crash, and sound, and the dialogue is clear, for the most part. Sometime the music overpowers everything else, and I had to rewind to catch bits of dialogue. Overall, the audio complements the stunning picture very well indeed. The extras is the point where this disc begins to lack. The only feature on the disc addressing the director’s cut itself is a two-minute introduction by Wolfgang Petersen. This is very nice, and gives some insight into why he made the Director’s Cut, but it doesn’t answer all our questions, like how did the Director’s Cut project start, what went in to editing it, why things were added, etc. All this could have been answered in an Audio Commentary, but sadly, there is no commentary of any kind on this disc. Even the IME (in-movie experience) commentary from the Theatrical Cut has been left off. What we’re left with is a series of about 40 2-5 minute shorts addressing all aspects of production, and they’re all fairly good. They certainly answer a lot of technical questions, but the fact that nothing on the disc except the introduction addresses the director’s cut is fairly disappointing. But fans should be happy with this batch of extras overall. The theatrical trailer is also included, and I’d advise watching it right after finishing the film; the trailer is in Standard Definition, and gives you a good idea of how big the jump between standard and hi-def is, if you didn’t appreciate it already. So in short, if you’ve got HD-DVD (or Blu-Ray) go pick this disc up right away. It’s not disappointing. The director’s cut is worth the price. It’s also available on standard DVD.